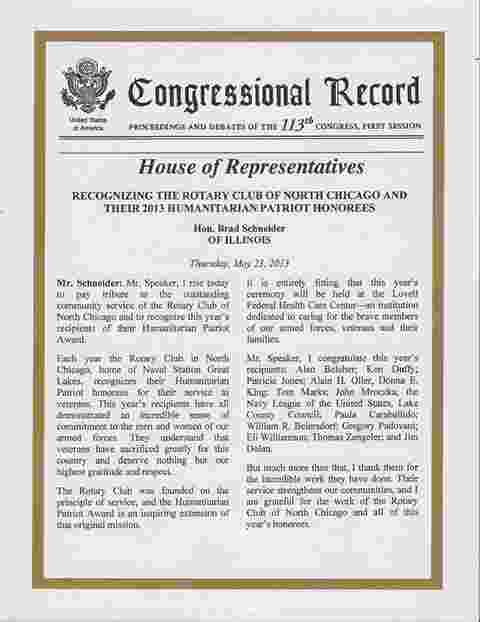 This month the recipients of The Rotary Humanitarian Patriot Awards were recognized in the Congressional Record, courtesy of the Honorable Brad Schneider of Illinois 10th Congressional District. 10th District Aide Ramachandra Villivalam visited the North Chicago Club on July 16th to present the event co-chairs, Dr. John Bair and Kevin Stevens, with the official certificate (see photo). The Humanitarian Patriot Awards Luncheon, held on May 21st at the Captain James A. Lovell Federal Health Care Center, served three primary objectives: Awards presentation, the keynote address on Post Traumatic Stress Syndrome (PTSD) and Traumatic Brain Injury (TBI) and a brief presentation on the Captain James A. Lovell Federal Health Care Center. The Humanitarian Patriot Award honors those who set an example of extraordinary commitment in the area of humanitarian support for United States Armed Forces Veterans and Returning Warriors. All District 6440 Clubs where invited to submit an awardee from their local community. This initial campaign produced 14 deserving awardees involved in grass roots work supporting our returning warriors, veterans and their families. Dr. Nutan Atre-Vaidya, (ACME Research at Lovell FHCC) delivered the keynote address on Post Traumatic Syndrome and Traumatic Brain Injury. Funds raised at the event are directly supporting treatment and research in PTSD and TBI. In addition to the awards and focus on PTSD/TBI, the program offered attendees the opportunity to visit and tour the James A. Lovell Federal Health Care Center. Facility Director Patrick Sullivan introduced this unique joint venture combining the active duty health care services for Naval Station Great Lakes with the former North Chicago VA Hospital. The one of a kind integration has resulted in greater efficiencies in providing services for both communities and impressive operational cost savings for taxpayers. North Chicago Rotary Club Past President and event co-chair John Bair is a Clinical Psychologist on staff at Lovell Federal Health Care Center specializing in mental health and stress disorders, as well as an Assistant Clinical Professor with Rosalind Franklin University. The Rotary Club of North Chicago is grateful for the support of our participating and supporting Clubs and the leadership of Rotary District 6440.